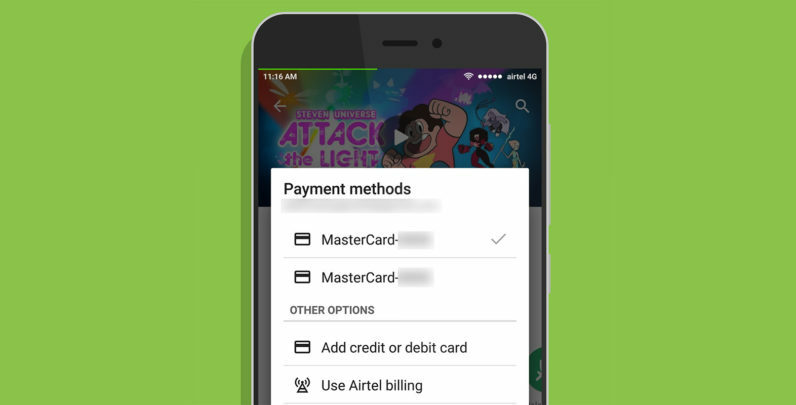 When Google Play introduced carrier billing for users in India last year, it only became available for Idea subscribers. That’s about to change as the feature expands to two of the country’s largest mobile networks. Android users on postpaid plans with Airtel and Vodafone will soon be able to pay for apps and in-app purchases on the same bill as their monthly mobile usage. According to Medianama, the new feature will reach roughly 182.6 million subscribers across these three carriers in the country. That’s big because many mobile users in India aren’t comfortable using credit cards: Less than 30 million of them are in use nationwide. However, it’s worth noting that since November, Google Play began accepting payments through Netbanking services which connect directly to customers’ bank accounts and authenticate them using single-use passwords sent across via SMS. It looks like the carrier billing feature is still rolling out, though. At present, only Idea is listed on Google Play’s support pages as a supported carrier in India, and the SMS-based verification to enable carrier billing for Airtel doesn’t seem to be working yet (I received an error message and couldn’t proceed with verification). Hopefully the rollout will be completed soon. We’ve contacted Google to learn more and will update this post if there’s a response. Update: Carrier billing now seems to be operational for Airtel customers. If you’re on Vodafone in India, please let us know in the comments if it’s working for you.